I’ve been a busy bee lately – doing some overtime and earning extra pennies for my house fund. Which is great, but it just means that I don’t have much crafty news to give you. I finally finished my twisted rib scarf and I’ll get around to blocking and listing it in my shop shortly. I’ve since moved on to a lacy number. I haven’t knitted a lace scarf before so I’m starting off with a simple stitch which should show off the lovely variegated pinky purple yarn I’m using. However, the last week hasn’t been all work and no play. My Grandad has been having a clearout and discovered a whole load of my Gran’s old knitting things which he has kindly passed on to me. They include a lovely knitting bag, a selection of knitting needles, wool, a tobacco tin full of cute buttons and a vast selection of knitting patterns. I also discovered a copy of Woman’s Weekly dating back to 1979! I’m looking forward to putting these things to good use. There’s a great selection of wool and I just love the retro style knitting bag. It’s not only practical but I’ll treasure it for years to come. 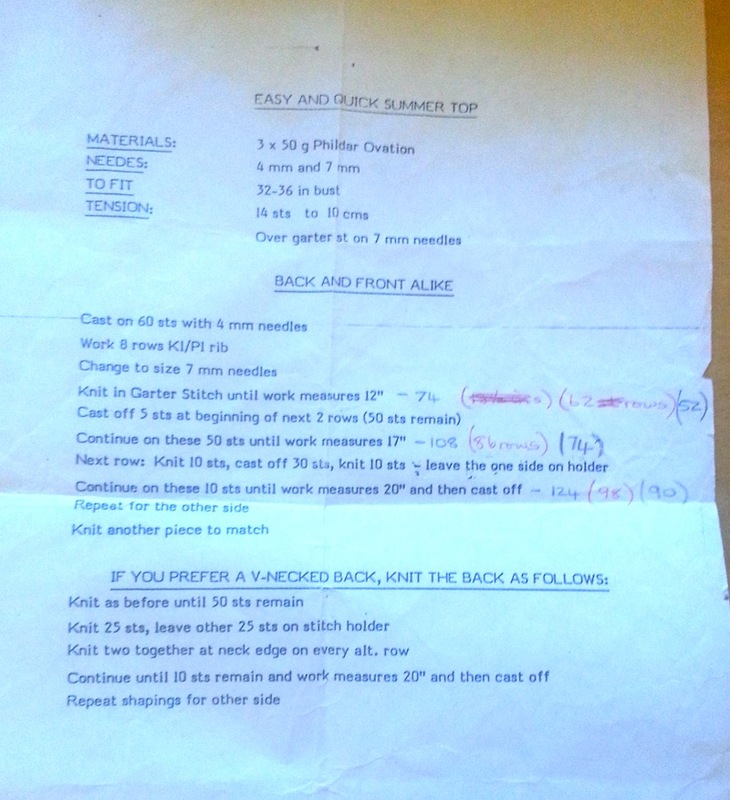 In browsing through the patterns I also discovered this hand annotated pattern for an “Easy and Quick Summer Top”. Feel free to make use of it. There aren’t any photos included so I have no idea what it looks like! If you do decide to give it a go, please share your results! I’ll hopefully have more work in progress to show you next week…until then, happy retro knitting!